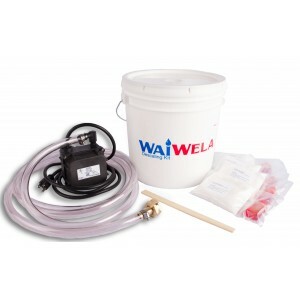 The Descaling kit is a simple, inexpensive, do-it-yourself method of dissolving mineral build-up from water lines. Includes everything you need to maintain your tankless water heater. Works with Tankless Installation Valves! Minerals occurring from hard water will adhere to the sides of copper pipe, gradually choking the water path and eventually interfering with the normal operation of your water heating and cooling appliances-leading to a subsequent increase in energy costs. The Descaling kit dissolves mineral build-up by circulating a safe descaling agent through your appliance. The descaling agent-color coded red-will turn clear when it is no longer effective. Regular maintenance will both ensure efficient operation as well as extend the life of your appliance. Used up all of your descaling agent? Have no worries a refill is available. Contains three additional pre-portioned one gallon treatments to use with your kit.